This post isn't so much about saving face as it is about saving a little money. The shirt I am wearing below with the adorable face silhouettes and carefully manicured hands as a collar is inspired by a more expensive version that retails for over $300, but my version from was only around $22 from SheIn. 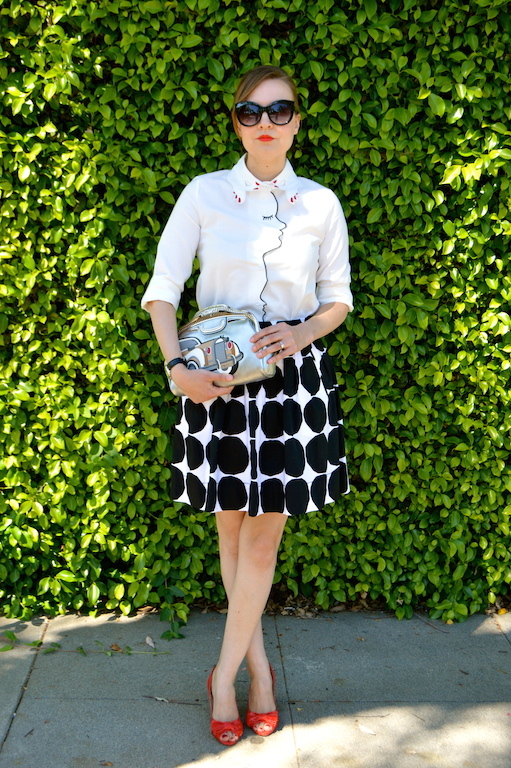 I love the quirky details of this shirt and that it can be worn with almost anything from jeans to this graphic print skirt that I picked up a couple of years ago from Banana Republic's collaboration with Marimekko. (By the way, I am really looking forward to the upcoming Target collaboration with Marimekko!) My husband actually picked out the clutch I am wearing today as a complement to my ensemble. He thought the vintage car on my clutch would enhance the face silhouette insofar as (at least he and I would like to think) it may be an homage to the original cover of F. Scott Fitzgerald's The Great Gatsby, featuring visage of (presumably) the character Daisy looking out over a bright skyline. How adorable is that blouse! I love the look and the hint of red adds a nice pop! Happy weekend! I LOVE that shirt! What fun! Oh, I love this outfit! That skirt and bag are so fun! Love the pop of red too! I have always loved that face/portrait blouse and I am thinking of picking it up. Also, thanks for letting us know about these great collaborations. I need to check out the Banana Republic one. BTW, your husband did a great job choosing the car clutch. 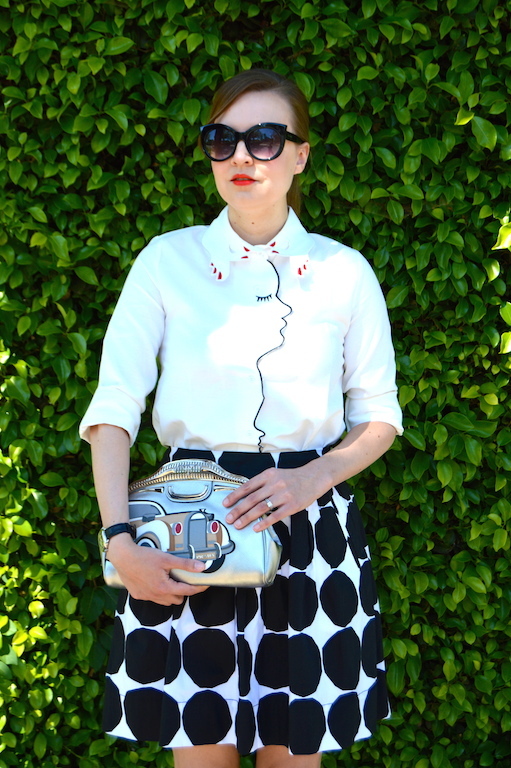 It gives the entire outfit a fun, whimsical retro feel, beautiful Katie! That shirt is too fun, and I think the way you styled it is perfect! The skirt adds to the whimsy but also adds polish, and I think your husband did well with the bag pick! I just love this! OMG ... super adorable, Katie! Thanks so much for sharing with Fun Fashion Friday! Hubby did very well with the clutch selection. I love the blouse...very Great Gatsby, indeed. Don't you love when you find a "steal" after seeing the "splurge"? Oh, I would be remiss if I didn't tell you how gorgeous those shoes are. Beautiful, Katie! That shirt is sooo adorable, and affordable! Your outfits always have that element of fun and art combined like this one. Congratulations, I featured you on my blog again today Katie. I just love how you dress and would love to own what is in your closet. Great blog! I love SheIn and when my hubby picks out an amazing item for me. Such a cute outfit. Coming from Elegance and Mommyhood feature.